Consumption has become as American as apple pie, the bottom-line definition of personal and national success. But evidence is increasing that the combination of our Wasteful Consumption Patterns and ever-growing population is steadily degrading the natural resource base, and robbing present and future generations of a decent quality of life. 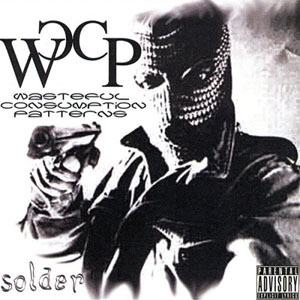 Wasteful Consumption Patterns, or WCP for short, was founded in 1999 by DJ Korpserape based on those principles and ideals. Korpserape made a few demos, shopped them around and was quickly signed to Intolerance Records. In between bare fisted fighting matches, weapons training and intense drug experimentation, Korpserape found the time to complete his entire debut album prior to the year 2000 at which point he found himself in a whole heap of trouble. It took Korpserape about seven months to write all the music and words and record the whole album "Solder". Unfortunately, for the next seven years Korpserape would find himself institutionalized in a mental health facility. He had the forethought to burn the master CD of "Solder", place it in an airtight container, and bury it somewhere nobody would ever find it. Present day, circa 2008. Korpserape is deemed acceptable for release. Not necessarily sane, but acceptable for release nonetheless. Now the world will burn as Korpserape unleashes his calculated rage upon all mankind. Embrace him, for he is the part of you that you most fear.